August 25th, 2016, is the 100th birthday of the NPS. Happy birthday and a large THANK YOU to everyone involved. 1) There will be no more ice ages. Probably not ever, but definitely not for a very, very, very, very, very, very long time. They're supposed to happen, in some form or another, every 100,000 years or so, and the last "Little Ice Age" ended around 1850 (the last legit Ice Age was around 12,000 years ago). No more are predicted mainly because of climate change, how humans are just spitting CO2 out like it's our jobs, because the ocean will stop dissolving as much calcium carbonate in the future, because the sun is only getting bigger, etc. It's a perfect storm, and scientists (shout out to Bill Nye, heyyy) are all pretty much in agreement. 2) A glacier is "a slowly moving mass or river of ice formed by the accumulation and compaction of snow on mountains or near the poles." If it doesn't move, it's just a pile of ice and snow, and it generally only moves if it's about 25 acres in size. Why does it move? Because ice is goddamn heavy when there's 25 acres of it, and with the help of gravity, that weight moves the ice and the surrounding soil and rock with it to whatever spot will succumb to it. Hello, movement and the formation of glacial valleys. 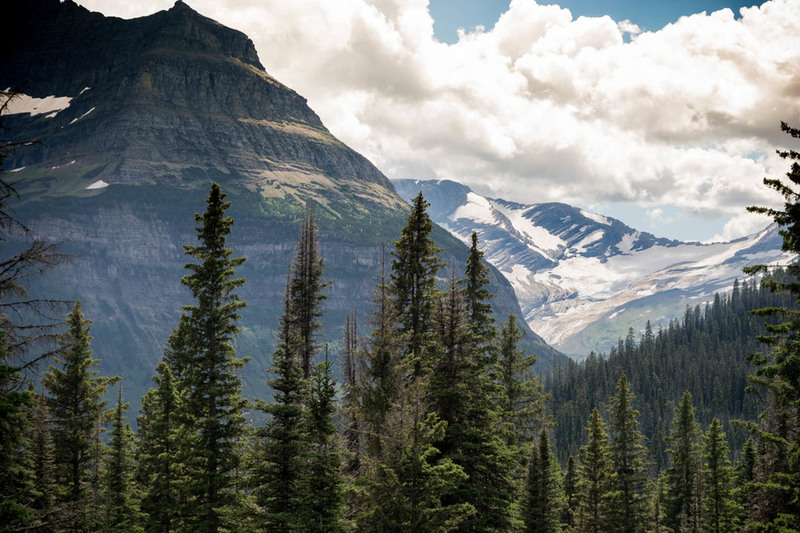 3) The most accessible glacier in the lower 48, Grinnell Glacier in Glacier National Park, is nearly gone. This is Grinnell Glacier, or what's left of it. That beautiful powdery teal lake at the base of that mountain? That's Grinnell Lake, and it wasn't there in the 1930s. Like so many others, it's forming due to glacial melt, and when the glaciers dry up, it'll eventually dry up, too. But let's stop talking doomsday for a second and focus on the human experience — and this is one human experience that your children and mine may not be able to have. Though all the world is worth seeing, few experiences deserve the time as this. Ice 7,000 years old, an icon of time, a bit of a National Park that will have less of a reason to exist within our lifetimes. That's something special, and that deserves talking about. 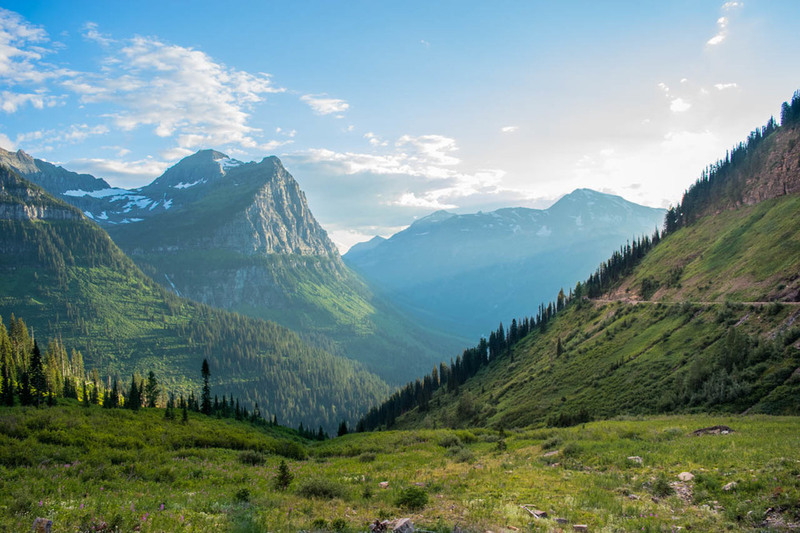 This hike, the one to Grinnell Glacier, is long and almost always uphill (it'll take 3 hours or so), but the path is well-defined and you'll see hikers of all ages and abilities. It may start hot at the base, but bring a jacket for the top. And bear spray, but more on that later. The first two pictures below are views you'll get from this epic (and yet somehow, sad) hike. Glacier National Park has increased 2.4°F since 1900 (Pederson et al. 2010), which is nearly 2x the global mean increase, regardless of whether this climate change is anthropogenic or not. 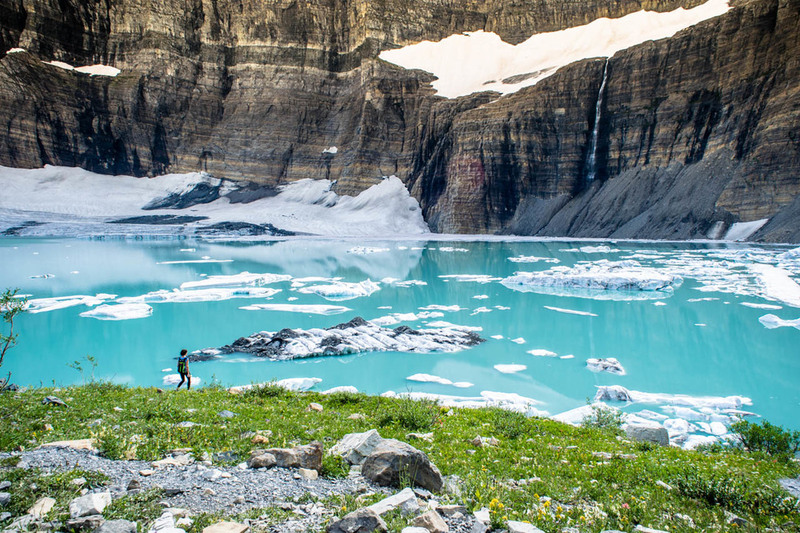 Scientists have predicted that the remaining 25 glaciers of the park (there were 150 around the mid-1800s) will be gone by 2030, never to return again. That's 14 years, and some even say before that. Heck, Boulder Glacier, once a tourist hotspot even in 1992, is now a pile of dirty slush. 7,000 years in the making, and it's now a few flakes hiding in the shadows. And while it'd be easy to think that the ice melting will simply be an aesthetic nuisance, there's more to it than that. It will be a nuisance, most definitely, but it'll also lead to streams drying up. And when the bottom of the food chain dries up, everything goes along with it. Even if they didn't dry up, they regulate temperature — without them, aquatic life will go haywire and many species may go extinct, with ripple effects throughout the environment. And then there's water for us — when glaciers go, so does our water. Just ask California. 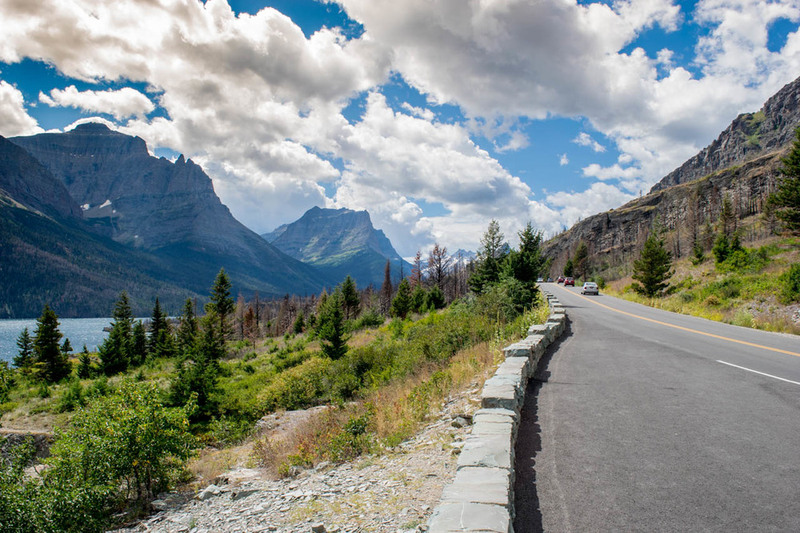 But for Glacier, this means fewer tourists, fewer dollars, and a dramatic decrease in the attention it and the NPS at large deserve. In Wyoming, the Cloud Peak Glacier, the only named glacier in the Bighorn Mountain Range, is forecast to disappear by 2034. In Washington state’s North Cascades, scientists documented record rates of melting in 2015 for all the region’s alpine glaciers, which collectively lost between 5 and 7 percent of their mass in a single year. In Alaska, the only Arctic state, glaciers shed 75 gigatons — or 75 billion metric tons — each year between 1994 and 2013, an amount equal to half the ice loss for all of Antarctica. Similarly impressive losses have been reported in other parts of the world. Greenland’s massive Jakobshavn Glacier set a record in August when it lost nearly five square miles of ice to a massive iceberg in a single day. Historic rates of melting have been observed for glaciers in theHimalayas, the European Alps, eastern Africa, New Zealand’s Southern Alps and the Peruvian Andes. The handful of glaciers that are not losing significant mass — those in the Arctic, for example — appear to be the outliers, experts say. So, in short, go. Just go. Be aware that the world around you is totally ephemeral. Fugacious. Fleeting. Temporary. Go and talk to the people you know so they can be aware, too. 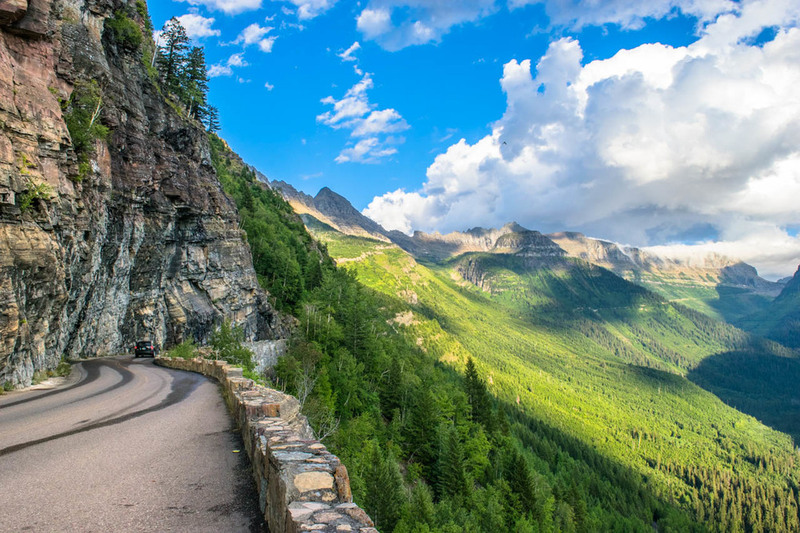 Help cultivate an appreciation for our National Parks. Annual passes are $80 for adults ($10 for seniors, free for military personnel), and the price gets lower every time you renew. I'm sure Ron Swanson has some inspirational quote about it being the best part of the government, and I think he's right. We need to pay our respect to the beauty at our doorstep, and even if you can't monetarily, do so by visiting. Your children may not be able to.